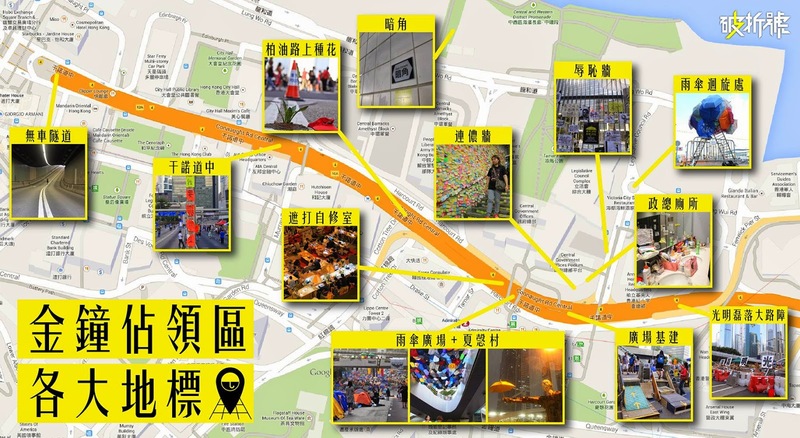 Major landmarks in Admiralty protest site. Image created by DASH. Pro-democracy protesters have occupied three major sites in Hong Kong for over a month now to demand an open nomination system for the candidates in the election of the city's top leader in 2017. So far, talks between officials and representatives of student activists haven't gone far — Hong Kong's government insists that the largely pro-Beijing nominating committee prescribed by mainland authorities cannot be changed. 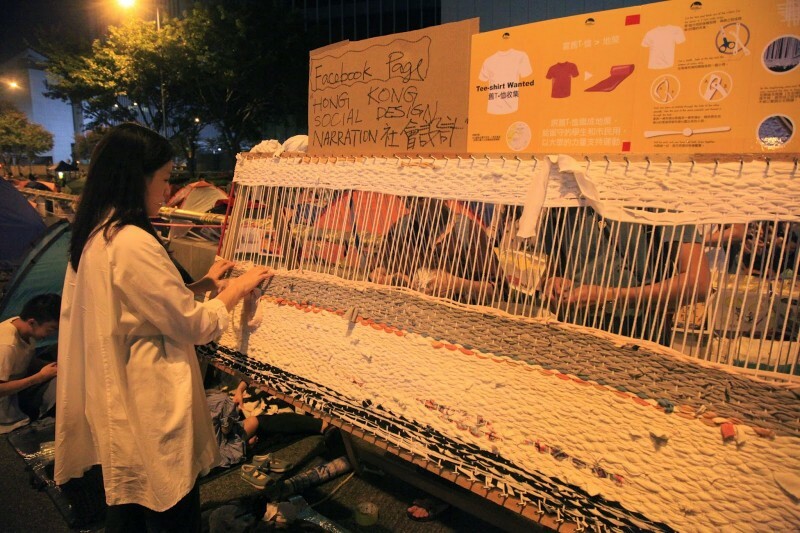 To prepare for a long-term occupation, protesters have turned the sit-in sites into orderly, functioning villages, decorated with political messages for the public by pro-democracy artists and designers. 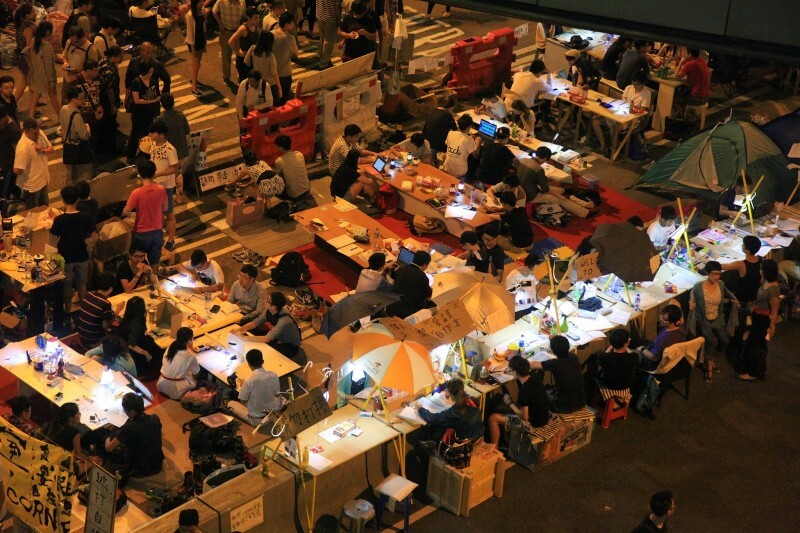 The protest site in Admiralty is serving as the headquarters for Occupy Central, as the movement is called. Here, organizers hold public gatherings and report on the latest developments of the democracy movement. At last count, protesters have set up more than 1,600 tents. 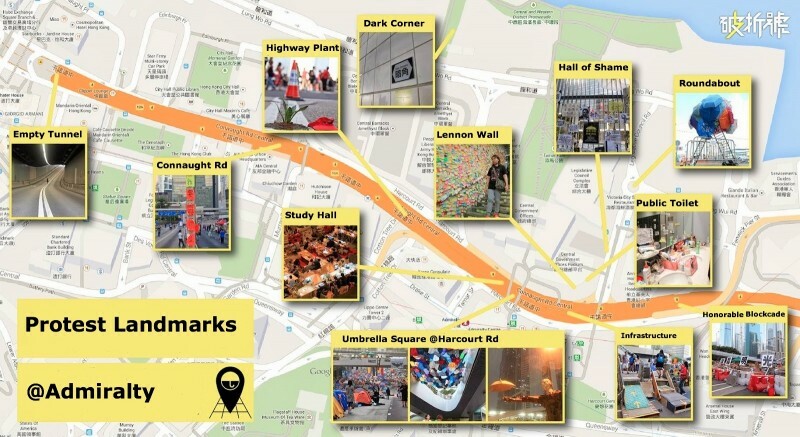 Dash, a student activist media platform, created a map (see image at top) showing major landmarks at the Admiralty protest site. Below is a brief explanation of the landmarks with photos taken by Au Kalun , a former journalist and a famous blogger. Umbrella Square. Photo taken by Au Kalun. 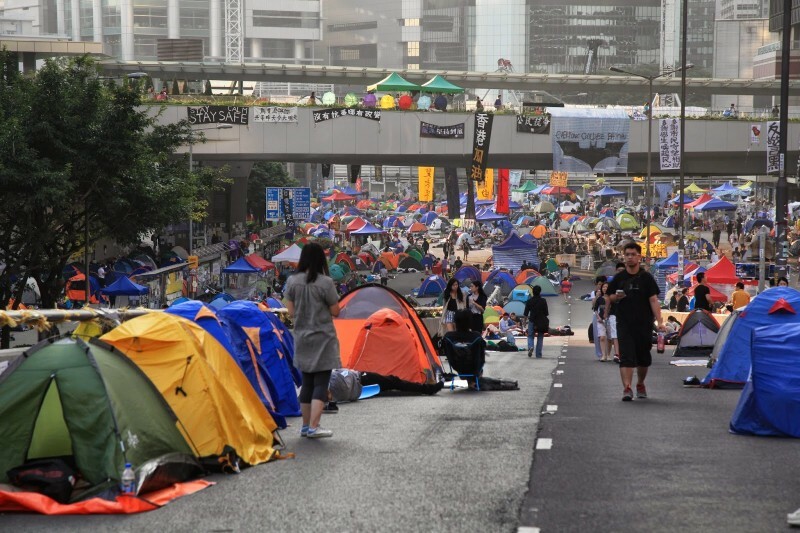 Protesters have occupied eight vehicle lanes across Harcourt and Connaught roads, with more than 1,600 tents erected here. 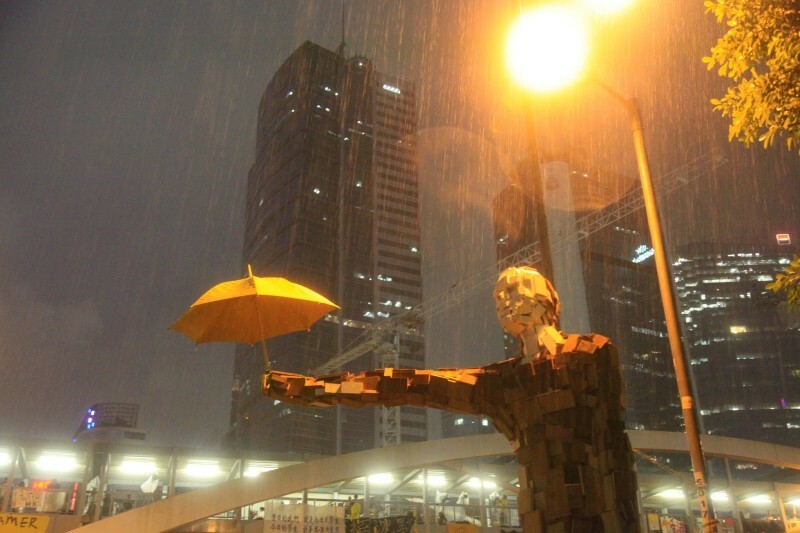 A statue, Umbrella Man, designed by a 22-year-old university student, stands in the so-called Umbrella Square. Umbrella Man statue created by a 22-year-old student. Photo taken by Au Kalun. Many students joined the class boycott to participate in the massive sit-in. To help them continue learning while on site, carpenters set up tables and chairs and volunteer teachers give classes in the study hall area. 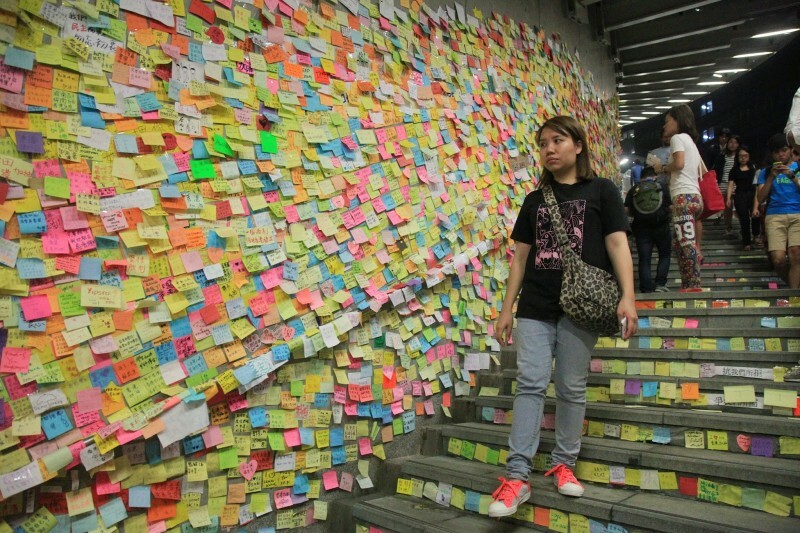 The Lennon Wall in Admiralty is covered with colorful Post-it notes. 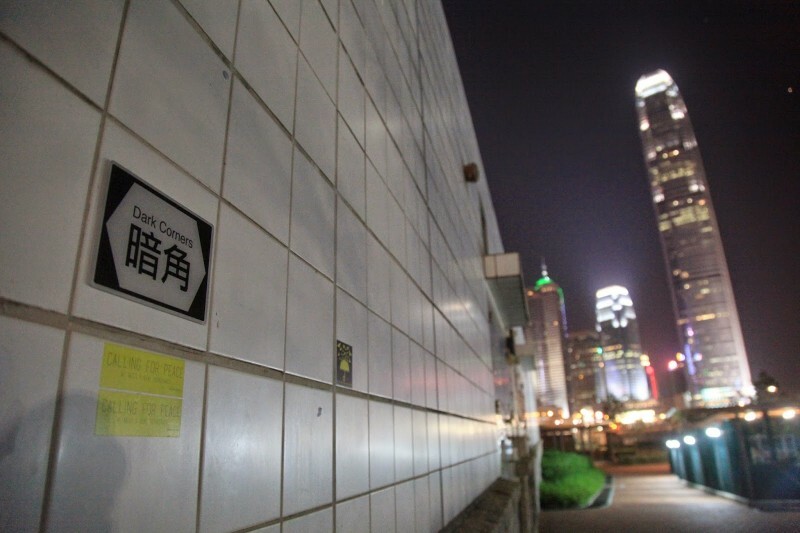 People write their wishes and dreams for the future of Hong Kong and stick them onto the wall. The wall of shame is the iron gate outside the government headquarters. The iron gate was built in August after a protest against the development of Hong Kong's Northeast New Territories. The city's top leader, the chief executive, then ordered security to be strengthened surrounding the building with a two-meter-high iron gate to prevent people from entering the square. Protesters have turned the wall into a forum for posting critical comments about the government. Two-meter-high iron gate outside the government headquarter is now called the wall of shame. Photo taken by Au Kalun. 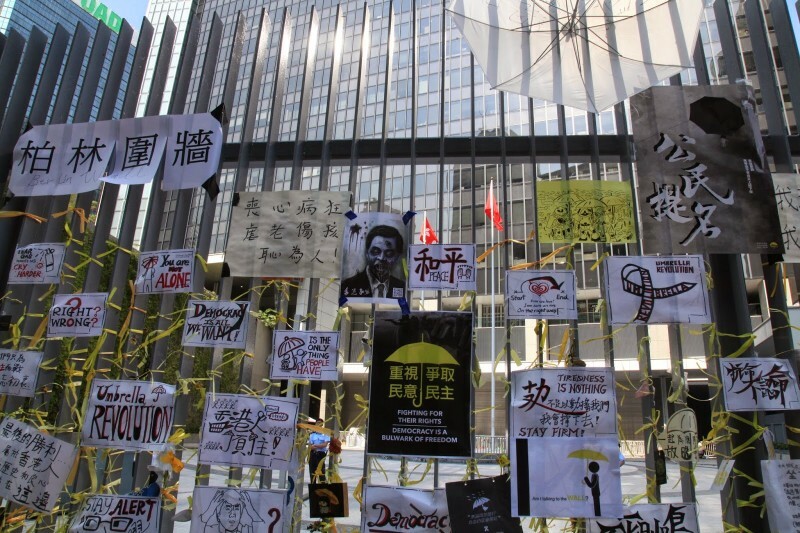 Beijing continues to say that Occupy Central will not change the politically rally of Hong Kong, a special administrative region of mainland China. 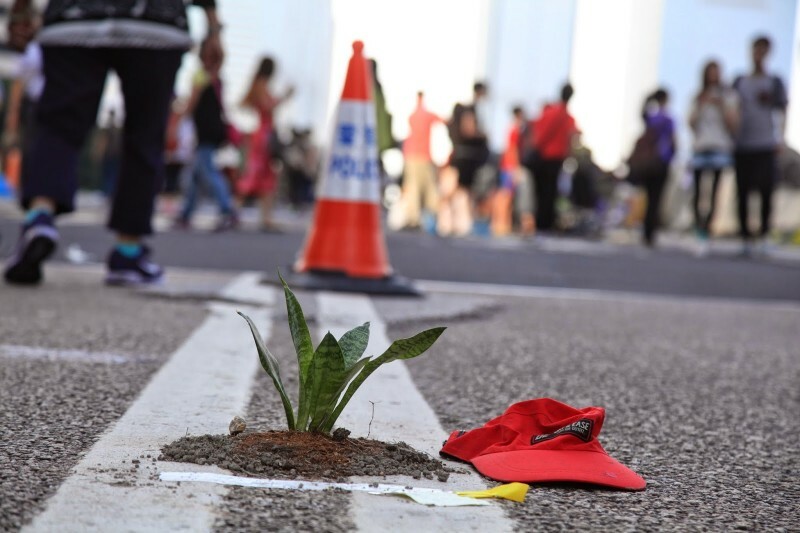 However, the students insist on “dreaming the impossible.” One artistic statement of this daring attitude is growing plants on the highway. A plant that symbolizes the realization of an impossible dream. Photo taken by Au Kalun. The police department has been under public scrutiny since they deployed tear gas to suppress peaceful protesters on September 28. Later, on October 3, opponents of the Occupy Central movement attacked protesters at Mongkok while the police turned a blind eye to the violence. Police denied that they allowed or worked with thugs to clear the protest site and stressed that the police department is “Guang ming lei luo” (光明磊落) – a Chinese term which carries a rich meaning to describe a person's character as upright and honorable, bright and straightforward, open and forthright, candid and sincere. Protesters and netizens have started using the term with a sense of sarcasm after the “dark corner” video was released . A hugh blockade set up by the protesters. They called it a “honorable” blockade. Photo taken by Au Kalun. 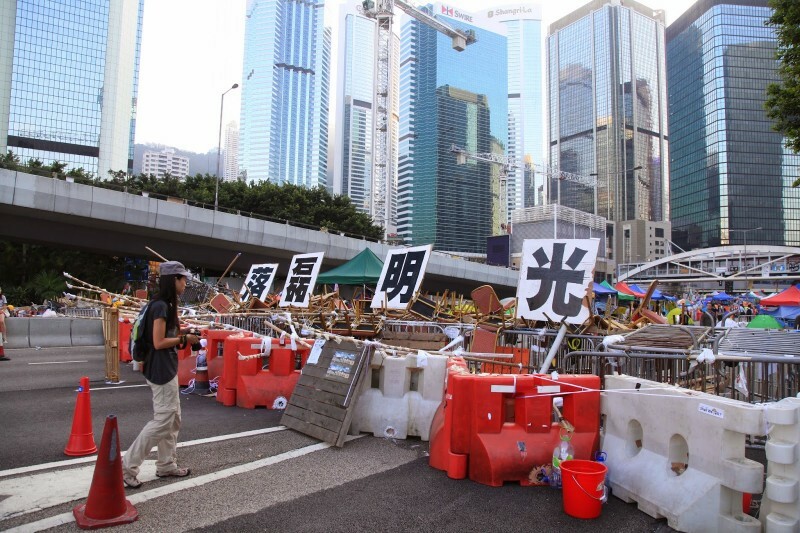 On October 14, protesters tried to block a major road, Lung Wo Road, that connects the eastern and western side of Hong Kong island in reaction to the police clearance of blockades that day. One of the protesters was handcuffed and brought to a dark corner where he was beaten by seven police officers. The beating was recorded by a TV news camera. The spot where the police violence took place became a major landmark in Admiralty. The spot where seven police officers beat up a handcuffed protester is now marked as dark corner on the google map. Photo taken by Au Kalun. Construction workers have set up infrastructure, such as staircases, to help people crossing the highway block and enter the protest site. 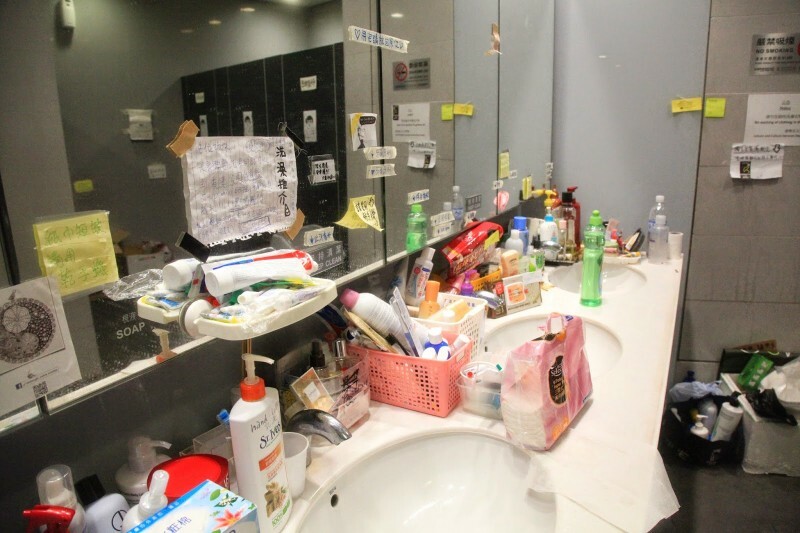 For the public bathroom near the government headquarters, people have donated all sorts of body care products like soap, toothbrushes, toner, napkins and tissue so that protesters can keep themselves clean while camping out. You can find all sort of body care items in the public bathroom near the government headquarters. Photo taken by Au Kalun. Connaught Road is a most congested road in Hong Kong island. The sit-in has transformed the city landscape and now the highway and the vehicle tunnel are empty and the air is free from exhaust. 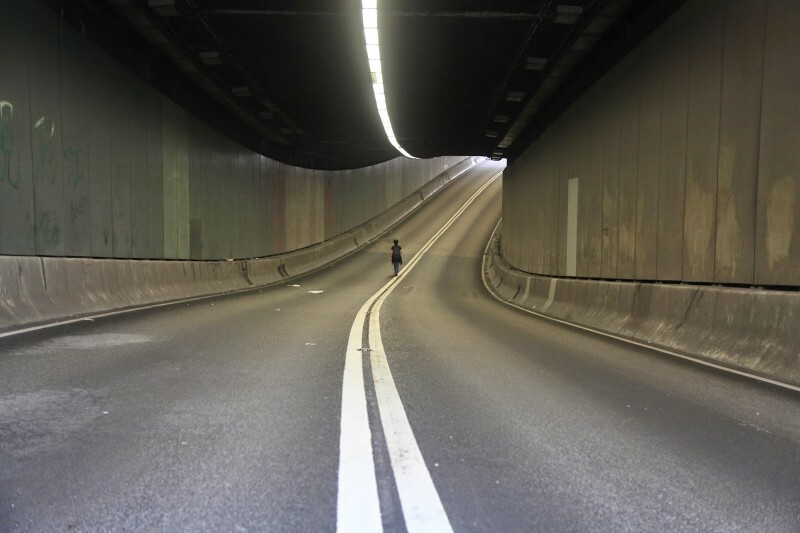 The empty vehicle tunnel looks rather surreal. Photo taken by Au Kalun. Civic groups that promote alternative lifestyles have also move into the protest site. You can see people weaving cloth, making leather products, painting and planting vegetables in the highway. The umbrella roundabout installation outside the Legislative Council symbolizes the need to reflect on the path of society's development. A simple weaving machine has been set up in the Harcourt village. Photo taken by Au Kalun.